The Dragon had no choice but to clinch Shogun and take him down. He would've been knocked out in a matter of seconds if he didn't. Machida tried to work the ground game, but Shogun had other plans: The Shogun knew he could teach the Shotokan Karate exponent a lesson in dynamic Muay Thai kickboxing. 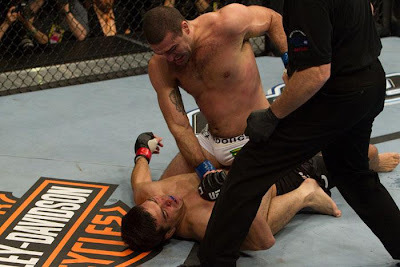 As the UFC commentators Joe Rogan and Mike Goldberg roused about how the unpredictability of UFC rematches, Shogun worked himself from the bottom, eventually escaping with 2:11 left in the round. Machida gave the possessed Shogun a knee to the right kidney, but was overwhelmed physically. Pinned against the cage, and running out of gas and options, Machida broke loose and engaged aggressively in a standup battle. 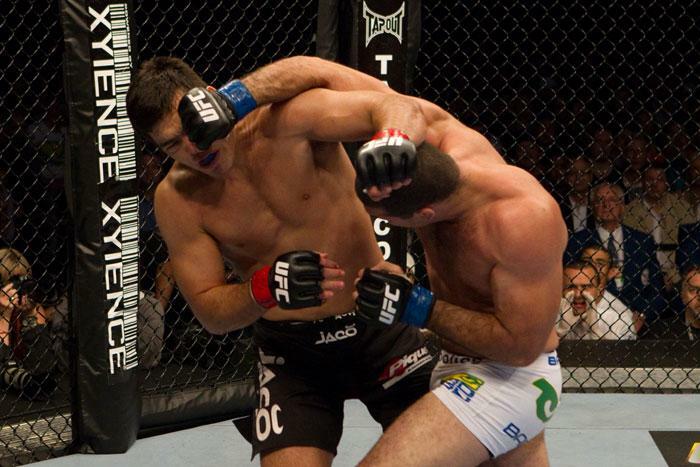 His left knee threw Shogun back for an instant, but Machida couldn't capitalize. His left cross from the southpaw stance was countered by Shogun with a perfectly timed overhand right hook to the temple. It was such timing that would undo Lyoto Machida's brief reign atop the UFC's light heavyweight division seconds later. What went down in Machida-Shogun II shows us that even a world class martial arts traditionalist who built his name on evasion and countering can be put down viciously by a world class kickboxer (boxer) if he forgets what makes a Thai or Western boxer tick. Simply, in what was essentially a classic style vs. style matchup, the Shogun slayed The Dragon by breaking his rhythm and splicing a full-beat left cross with a half-beat overhand right. It's quite possible that Lyoto Machida could've saved himself by throwing a fast lead right instead of the slower left cross which was instantly countered by Shogun: Machida's resetting himself after ramming Shogun with a solid left knee clearly gave the Muay Thai stylist time to recover and defend himself. Instead of surprising Shogun with an immediate follow-up strike (punch or otherwise), Machida let the dangerous kickboxer gather himself and track his movements. And when The Dragon compounded the problem by throwing the long left rather than the short, quick lead right or jab, the fight was as good as over. Ultimately, Machida-Shogun II teaches us an important lesson: No matter what we do in life, martial arts or no martial arts, we must learn as much as we can from the world around us and take control of our destiny. So let's stop acting like we don't know. If s*** can happen to a smart, dedicated, world class professional like Lyoto Machida, then it can happen to any of us. TraditionalKarate_Stylist ("TKS") on, "We Must Learn | SCRIPT FIGHTING;" RE Shogun Rua's KO of Lyoto Machida @ UFC 113. TKS has seen reviews & analyses in greater detail, as well as some good & generally insightful articles on the loss by Machida to Rua, particularly about the now infamous knockout. From my traditionalist karate perch, your critique is the best, straight-shot @ capturing how Rua simply outfought Machida and the resulting KO. The clip (you reference) of Rua over Jackson @ PRIDE is my all-time favorite MMA video. As a karate stylist, TKS is partial to Lyoto Machida and his Shotokan Karate, naturally. The truth be told though from a full-contact fighting standpoint, Rua's Muay Thai kickboxing (boxing) was simply too much for Machida. I too, was concerned that Machida would lose the rematch. TKS likes to say that between the boxer and the karate fighter, the boxer WINS EVERYTIME! There is one, special exception; and Lyoto Machida didn't do it @ UFC 113. TKS thinks the author (or Dr.?) here would make a superb MMA coach or trainer. This critique gives solid, understandable input on the failure of Lyoto Machida to fight Shogun Rua effectively. TKS closes by saying that boxing-type answers or scripts are not the 'special exception' TKS is talking about. Good Luck with, and TKS looks forward to your next 'Script Fighting' Lesson. Thanks for your kind comment : I am humbled. Simply, I'm merely a student of the game, who writes down what I observe and think. While the major remastering process (and other operations duties) that I'm putting my website is making me very busy, I'll do my best to fill in when time allows. Whether it's metaphorically, analytically or narratively, I try my best to bring a refreshing element to every piece I produce. @ Dr. HotNonPorn concering what Machida could have done differently. TKS: You are the only commentor on the 'net I have seen who has suggested striking alternative(s) @ that brief encounter where Lyoto Machida was KO'd. Would your suggestions worked? Don't know. But what was plain--the standard Machida karate straight-left was well prepared for by Shogun Rua in preparing for this fight. Your comment shows that it isn't specifically a MMA coach, martial artist, or sports-fighter person who can find the right alternatives, it's the thorough, sophisticated thinker.